When it comes to STEAM projects, my kids love activities that involve a wide range of skills. 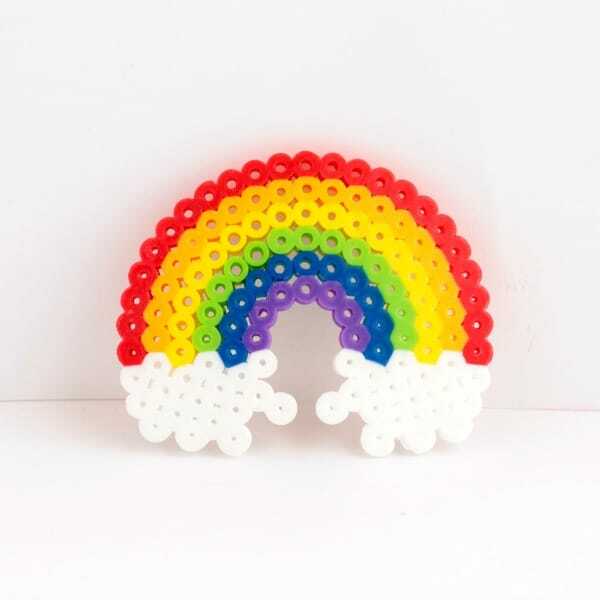 For example, we used engineering to make a perler bead rainbow! 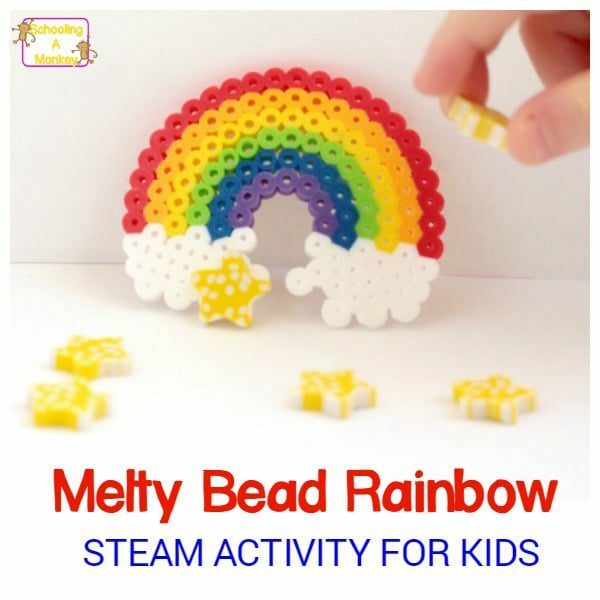 In this project, kids can boost their engineering skills and learn pattern skills, design skills, and fine motor skills with this super-fun and super-colorful melty bead rainbow. We love making our STEM activities so much fun that kids don’t realize they are learning while having fun! But you can’t beat a project like this for teaching math skills, engineering skills, and fine motor skills. This engineering activity for kids would make the perfect addition to any ST. Patrick’s Day STEM activities! Kids will absolutely love this project, and you can teach them all about the light spectrum, color theory, and visible light at the same time. 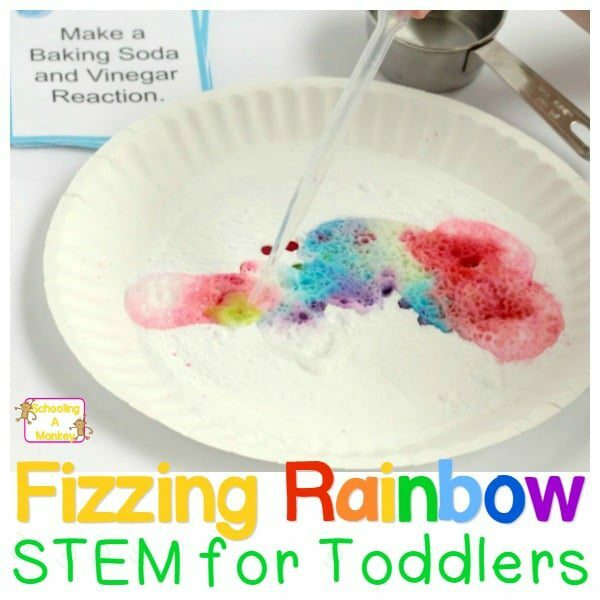 A STEM activity (sometimes called STEAM activities, too, if there is an art element) are activities for kids that include elements of Science, Technology, Engineering, and Math. These four elements are the cornerstone of modern careers and scientific advancements. Children can benefit from completing STEM activities not just because it helps them learn more in the STEM subjects, but also because it helps them see how these subjects are used in the real world. As a side benefit, STEM activities help children learn to think creatively, logically, and critically about everything they do and see. STEM activities at the toddler and preschool level focus on exploring, sensing, spacial awareness, cause and effect, counting, sorting, and patterns. Get the STEM SUPPLY LIST and make setting up your STEM centers a breeze! WHY ARE ENGINEERING ACTIVITIES IMPORTANT? Engineering activities for kids are all about teaching kids elements of design, structure, choosing the right material for the job, and creating a solution to a problem that fits their environment. In the adult world, there are many types of engineers, from data engineers to civil engineers. Children have a base knowledge of engineering, but may not understand the terminology of engineering that they already understand on a subconscious level. Giving children engineering challenges will help them unlock their subconscious and help them realize how important engineering is for just about every career path. 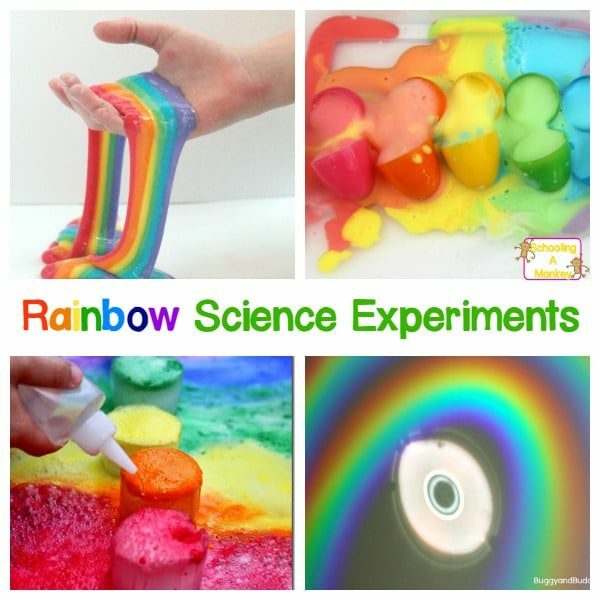 WHAT DO KIDS LEARN WITH THE RAINBOW ENGINEERING CHALLENGE? The goal of engineering activities at the preschool and elementary level is to explore the world and learn the basics of the scientific method, the creative process, and how to tie all elements of science, technology, engineering, and math together. A rainbow engineering challenge will foster a love of STEM topics in your students that will last a lifetime. WHY DO SEASONAL STEM ACTIVITIES? You probably agree that STEM activities are important to do even with the youngest kids. But you may not want to try seasonal STEM activities with your class. There are tons of evergreen STEM activities that you can do, and you’ll probably never run out of STEM challenges. So why bother with seasonal STEM? I like doing seasonal STEM activities with my kids because it adds an educational element to our holiday celebrations. Rather than just doing a seasonal craft, we do a few STEM activities that match the current season or holiday. Seasonal-based activities also provide a way to engage kids who might be reluctant to do science or STEM challenges on their own. Some kids might not want to design an energy efficient house, but they’d be perfectly happy to build a leprechaun trap for St. Patrick’s Day! GET THE STEM ACTIVITY WORKSHEET! Use this worksheet to record the results of your STEM activities. 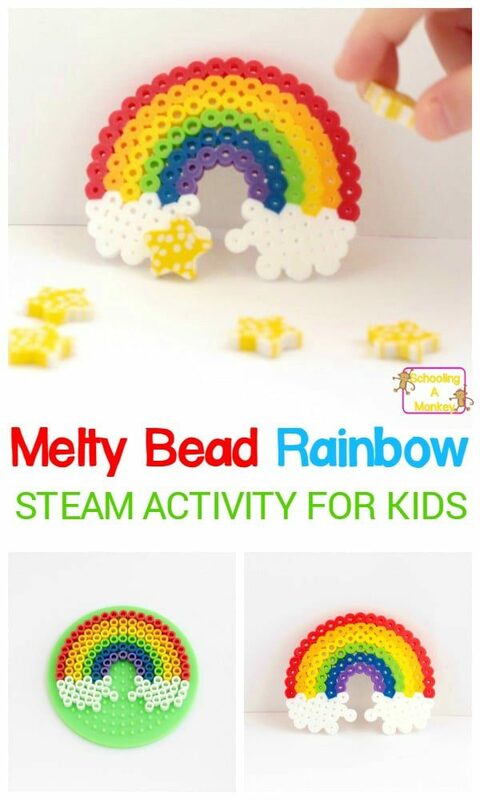 If you want to just make a melty bead rainbow, you won’t be able to tie it into STEM because the kids won’t realize they are using STEAM skills. So you have to tell them. 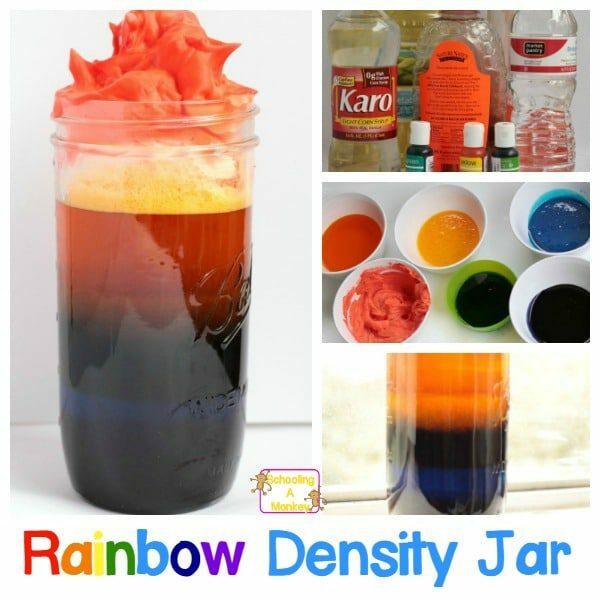 This rainbow project would make a fun project to go along with a rainbow unit study or a study on the light spectrum. Science: Use this project as a jumping off point for a lesson on the visible light spectrum. Why do colors appear the way they do to us? What changes our perception of colors? Do different colors of light act differently? Why is the rainbow always in ROYGBIV order? Technology: Perler beads are a marvel of technology! You can talk about how the beads are made using large machines and what sort of technology had to be invented before this project could be made. Engineering: Kids have to think about their design before making it. This requires blueprints, diagrams, planning, and execution, all important engineering skills! Art: Nothing is prettier than a rainbow! Math: Patterns and counting are used in this project. 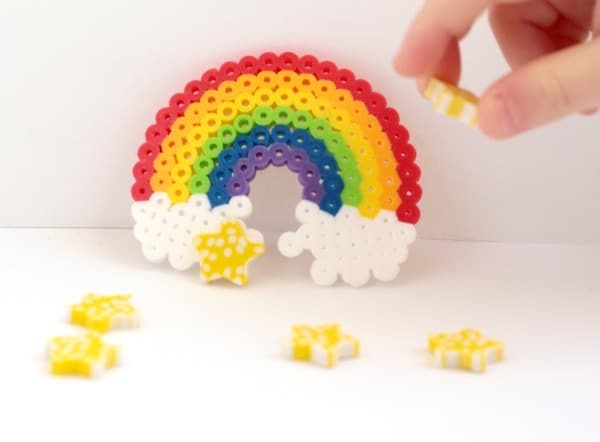 Design and make your own melty bead rainbow using this simple set of instructions! Kids will love this project and will display it with pride. Disclaimer: This post includes affiliate links for your convenience at no extra charge to you. 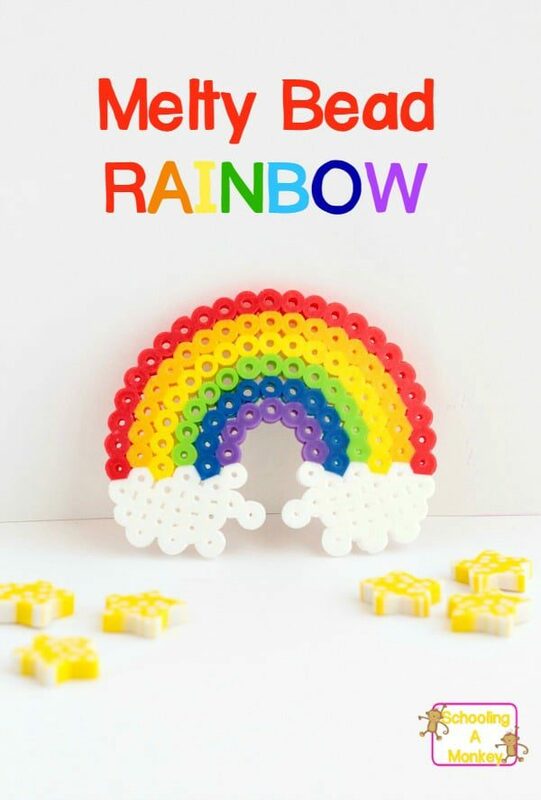 First, design your rainbow. Kids will have to determine how big they want their arch to be and how much the colors overlap. My kids tried to make all colors even, but they still had to work for a little while before they came up with the shape they did. 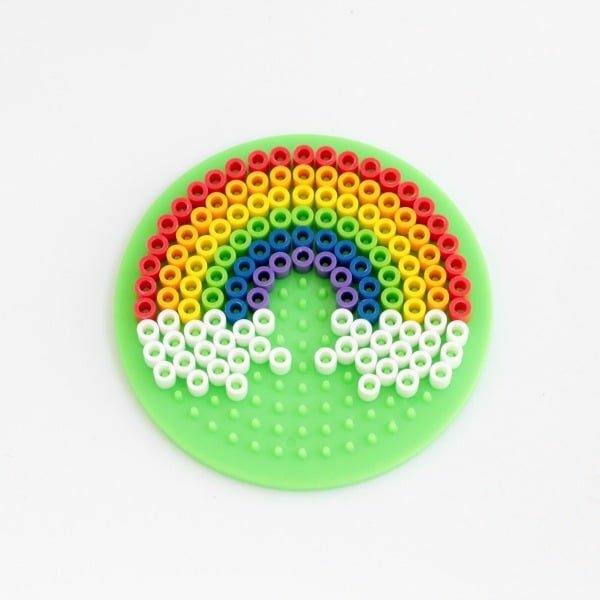 After designing the rainbow on a piece of paper, add the beads to your circle tray. This takes fine motor skills or else you end up knocking all the beads off constantly. Once the design is ready (ours had clouds on either end for more fun), place a piece of wax paper over the design. Melt with a warm iron for about 40 seconds (but watch it, because it is possible to melt the beads too much). After the wax paper cools, flip the beads, place the paper back on top, and iron the other side. 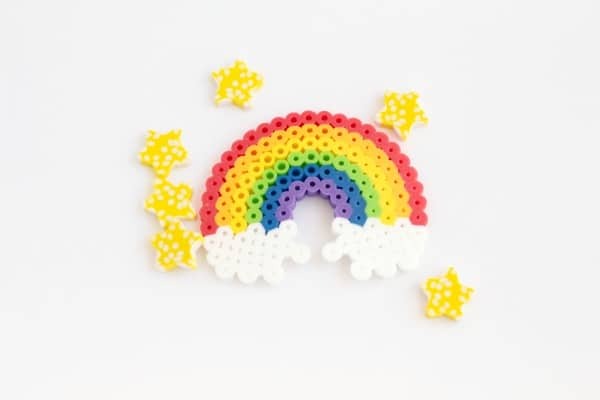 Use a string or hook to hang the Perler bead rainbow, if desired.